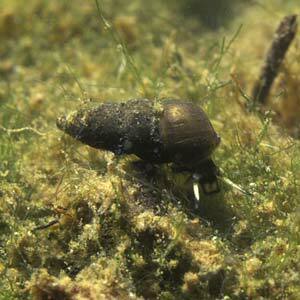 Hydrobia acuta neglecta is a minute mud snail found in brackish water along the coast. Despite their small size, some mud snails are important sources of food for migrating and overwintering birds in sea bays and inlets. The commonest is Peringia ulvae (Pennant) which occurs in vast numbers on the foreshore of Strangford Lough. Hydrobia acuta neglecta, like the very similar Ecrobia ventrosa, is not found in the sea but in coastal brackish lagoons or pools separated from the sea. It is rare in the British Isles. The cause of recent decline is probably a combination of reclamation and changes in the salinity of previously occupied habitats. Hydrobia acuta neglecta belongs to the family Hydrobiidae. The British Hydrobiidae were formerly all included in the genus Hydrobia but the other species have now been placed in separate genera. Hydrobia acuta is small at about 4-6mm, has a sharp spire, is dark in colour and has a small, horny flap called an operculum which closes the entrance to the shell. The animal’s head behind the eyes is dark in colour, its tentacles are a uniform white with a black ring just behind the tip, and its fore-body (snout) is mid-grey with two large, pale spots. The shell differs from that in related hydrobiids by its relatively flattened whorls and shallow sutures (lines separating the whorls). Like all hydrobiids this species occurs all the year round crawling in mud in its favoured habitat. Reproduction is mainly sexual, that is, some individuals are male and some female and these mate to produce fertile eggs which hatch in the females’ body before emerging as young snails. It can occur in great numbers, with individuals at all stages of development, in suitable habitats but seems to prefer more saline places than the other brackish-water hydrobiid Ecrobia ventrosa. 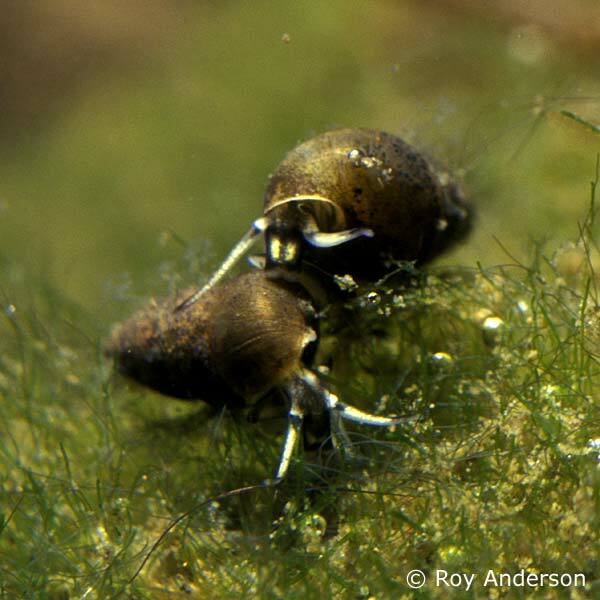 There are a total of five British and Irish mud snails described under Ecrobia ventrosa. The only viable colony known in Northern Ireland is at Ann’s Point lagoon near Mount Stewart on Strangford Lough. 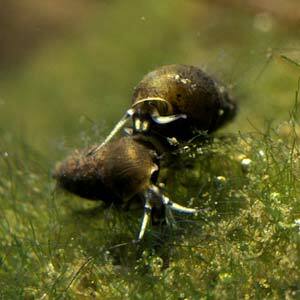 It lives in mud and at the roots of plants in shallow water and feeds on algae. Ann’s Point Reserve is managed by the National Trust for wetland birds and the public are discouraged from visiting because of the potential for disturbance. There are no hides or other facilities at the site. The species was feared extinct in Northern Ireland until the rediscovery of the Ann’s Point colony in 2001. “Hydrobia ventrosa” was recorded there about a century ago but at that time Hydrobia acuta was not recognised as a separate species from Ecrobia ventrosa. Old records of “Hydrobia ventrosa” apart from the Ann’s Point record, mainly refer to Ecrobia ventrosa (Ross, 1984). Kerney (1999) indicates a second Northern Ireland site for H. acuta neglecta at Magheramorne, Larne Lough. This has been visited recently but only Potamopyrgus antipodarum is now present in the area and the site is presumed lost. In southern Ireland two recent sites are known: on Inishmore, Aran Islands, County Galway; on the Mullet, West Mayo. It appears to be readily outcompeted by the marine mudsnail Peringia ulvae where the two occur together. It is also vulnerable to habitat destruction, sea level rise and to changing salinity in lagoon systems. Changing salinity and organic pollution. Strangford Lough is designated as an ASSI and Marine Nature Reserve. The status of Hydrobia acuta neglecta will be surveyed and monitored and appropriate conservation action undertaken if required. If you see small brackish water ponds or lakes forming anywhere around the coast please note the locality from an Ordnance Survey map and report the details, to CEDaR, National Museums Northern Ireland, 153 Bangor Road, Cultra, Co. Down, BT18 0EU. Tel: 028 9039 5256, cedar.info [at] nmni.com, or to the author of this article (roy.anderson [at] ntlworld.com) so that an investigation can take place to identify suitable sites for the endangered brackish water fauna in Northern Ireland. Sites should be connected only indirectly to the sea, that is, should not be tidal, and ideally have some freshwater input from the landward side and a stable water table, that is, not drying out periodically. Small and potentially rich habitats can be created relatively easily by landowners through the impoundment of small areas. These act not only to conserve brackish faunas but provide important feeding areas for marine ducks and waders. Anderson, R. (1996). 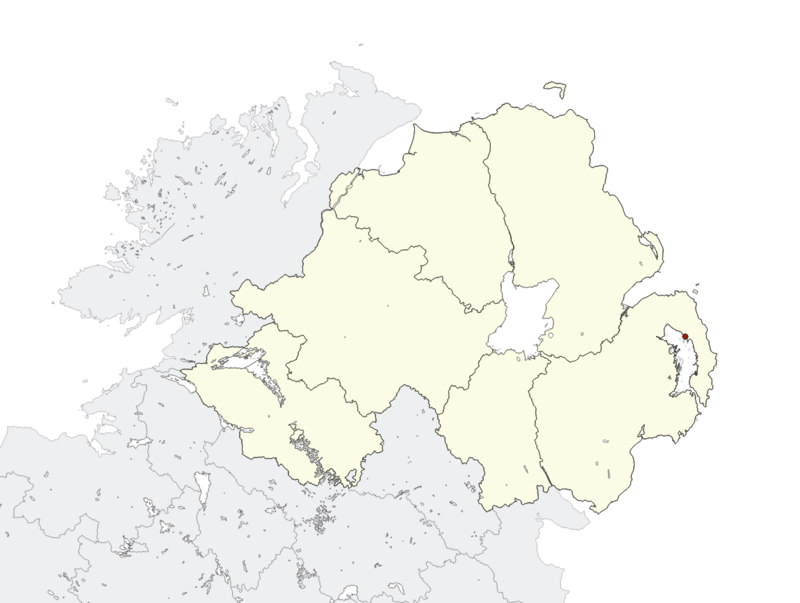 Species Inventory for Northern Ireland: Nonmarine Mollusca. Environment and Heritage Service Research and Development Series. No. 96/1. Kerney, M. P. (1999). Atlas of the land and freshwater molluscs of Britain and Ireland. Harley Books, Great Horkesley, Essex. Ross, H. C. G. (1984). Catalogue of the land and freshwater Mollusca of the British Isles in the Ulster Museum. Ulster Museum, Belfast.